Crews on Monday recovered the body of a missing backcountry skier who apparently died in an avalanche in southwestern Colorado as the danger level remained elevated following heavy snow over the weekend. Teams working with avalanche dogs found the man's body in a slide believed to have occurred Sunday in the Matterhorn area near Telluride, the San Miguel Sheriff's Office said. Because the risk of avalanches was high, crews had to wait for helicopters to drop explosives to trigger slides and reduce the danger of natural slides before ground crews could go in to search for the man, who was reported missing after failing to return home, sheriff's office spokeswoman Susan Lilly said. 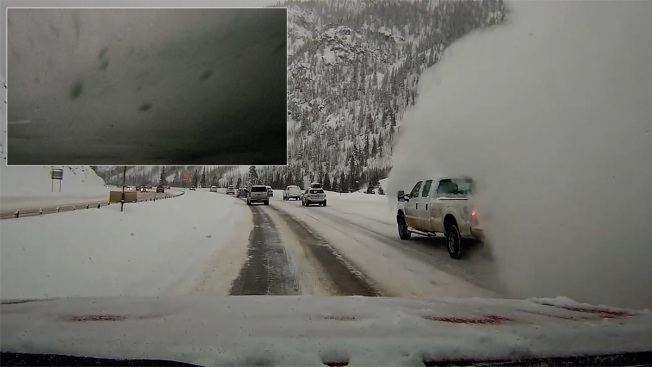 On Sunday, another avalanche dumped snow across a section of Interstate 70, a highway that connects the Denver area to ski resorts, between Frisco and Copper Mountain. No injuries were reported. Video captured by Jacob Easton shows a cloud of snow coming down the mountain on the opposite side of the highway before sliding across both sides of the interstate. It shows snow covering a pickup ahead of his vehicle before the snow sweeps down to his vehicle, completely covering the windshield. His vehicle was not trapped. Another family told NBC affiliate KUSA that their Toyota Tundra pickup truck was pushed off the road by the avalanche after it approached from behind. No one was hurt, but they were shaken by the experience. "We felt our truck, you know, literally sliding off the road. That's when it became really real," Shaune Golemon said. "It was like, this could be bad. We could get buried." According to the Colorado Avalanche Information Center, up to 3 to 4 feet (1 meter or more) of snow fell in some parts of the region where the I-70 avalanche happened. While the slide danger caused by all the new snow likely peaked on Sunday, it said the danger was still high — just below the top rating of extreme — in the Front Range, Vail and Summit County, Aspen, Grand Mesa, Gunnison and Sawatch regions. Avalanches on well-traveled roads in Colorado are rare. When the slide danger is high, roads are often closed so crews can trigger avalanches at places prone to slides.